The Arnot Art Museum recently announced the results in the 2019 New York/Pennsylvania Scholastic Art Awards program. In this, the 76th year of the museum’s association with the program, over 900 works were entered for adjudication with 230 receiving awards. 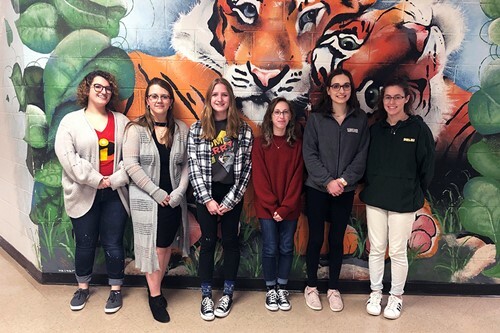 Congratulations to six UEHS art students who were recognized for their artistic talents under the teachings of Diane Golden and Cindy Henry. At noon on January 27 dignitaries, teachers, parents, education administrators will be on hand to recognize the young artists of New York and Pennsylvania at the Gala Awards Presentation at the Clemens Center in Elmira. This special event honors students, teachers, and schools, and publicly recognizes the young artists of our region. American Visions Best-In-Show honors will be announced during the event. After the ceremony the Scholastic Art Awards 2019 exhibition will be unveiled at the Arnot Art Museum and will be on view throughout the month of February. In photo, l-r: Maria Fiacco, Arianna King, Alexis Harris, Emily Sierzant, Laura Zibbon, and Sydney Derick.